Farrar, Straus and Giroux, 9780374282097, 320pp. “Witty, gritty poet and memoirist Kleinzahler” (Publishers Weekly) has gathered the best of sixteen years’ worth of essays, remembrances, and reviews in this scabrous and essential collection, setting down his thoughts about great poets and bad poets, about kvetching fiction writers and homicidal musicians, about eccentric critics and discerning nobodies, always with insight and humor, and never suffering fools gladly. 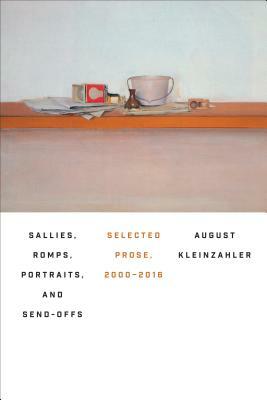 Here, in Sallies, Romps, Portraits, and Send-Offs, August Kleinzahler eulogizes famous friends, warts and all (Thom Gunn, Christopher Middleton, Leonard Michaels); leads the charge in carving up a few bloated reputations (E. E. Cummings, Richard Brautigan); and sings the praises of unjustly neglected masters (Lucia Berlin, Kenneth Cox). He also turns the spotlight on himself in several short, delightful memoirs, covering such subjects as his obsessive CD collecting, the eerie effects of San Francisco fog, and the terrible duty of selling of his childhood home.